Straws Individually Wrapped. 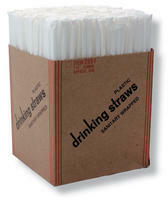 Each Box contains 500 individually wrapped drinking straws, just like you see at most restaurants. Each Straw has paper wrapper.